Cool mornings and balmy days. Autumn is in the air. There is something so serene in these perfect days with their blue skies and changing light. I find it all very energizing. I know that winter will be just around the corner, so I am torn between wanting to spend every moment outside or making my home cozy for the colder days ahead. 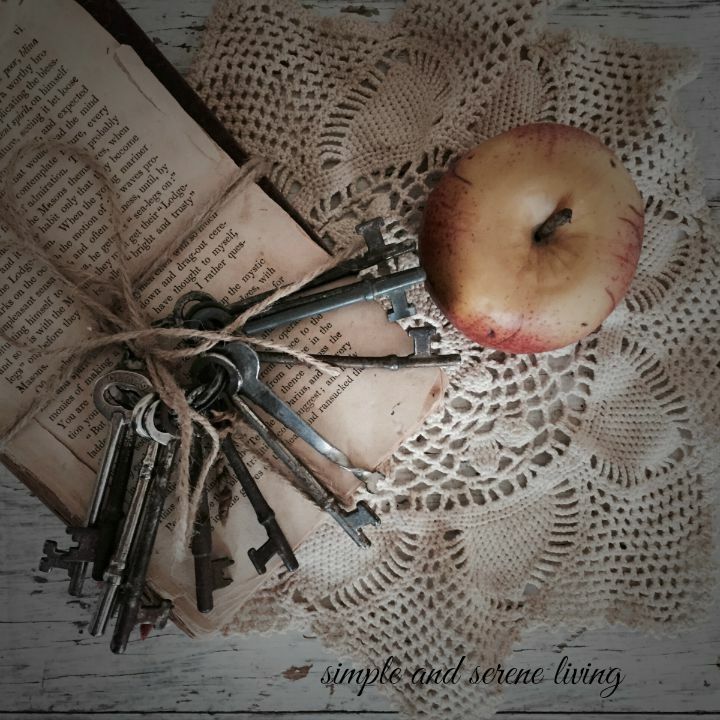 Fall decor is everywhere. 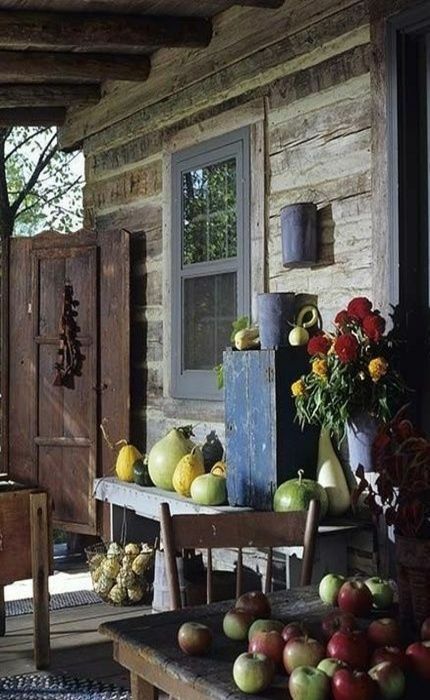 I wish I had a front porch to decorate like this one. It makes me want to gather apples and bake pies. I love this fall dried wreath on the rusty old iron gate, tempting passersby to wander into the garden beyond. It is definitely the season for pumpkins and chrysanthemums. This is one time of the year I am a fan of orange. 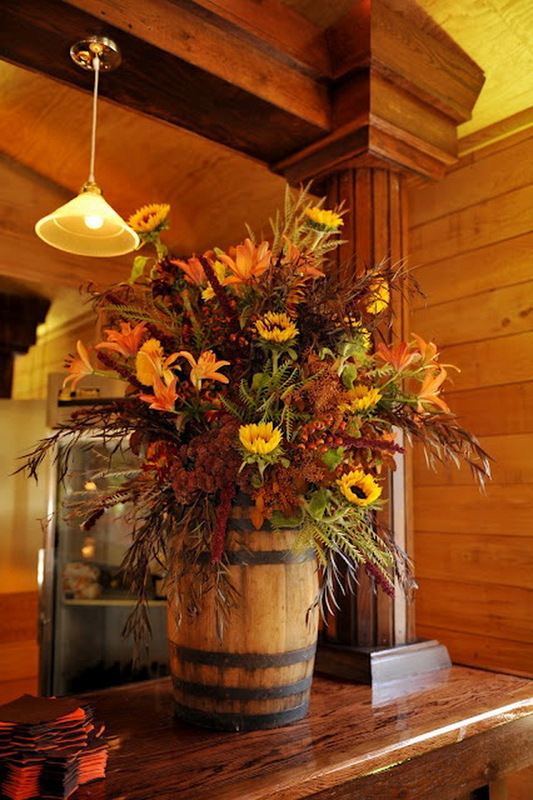 This arrangement of fall flowers is gorgeous. It's making me want to head over to Trader Joe's and see what they have. I hope your fall weather is as perfect as mine is today and that you are able to get out and enjoy it. Fall is my favorite time of year. I just brought my large Fall wreath up from storage this morning. We have a wonderful nursery not too far away who supply all the beautiful giant mums for Costco in BC and Alberta and they have a lovely shop to buy direct as well. I am looking forward to a trip there soon. That bouquet is gorgeous. We don't have Trader Joes here in BC. I can tell we are missing out on a lot of great stuff. I'm sure your wreath is gorgeous. Have fun on your trip to purchase mums. So pretty! I am ready for some cooler temps and fall decor! Beautiful and definitely fallish. I'm loving this weather as well. I even now have a front porch, but so far no decorating. Then again, we're so far from the road no one would see it. Hope you have a great week, Laura. Sitting out on a front porch and enjoying a cup of hot tea would be a perfect fall way to pass the time for me. I could skip the decorations then. Hope you have a great week too, my friend. Oh goodness, you have certainly captured Fall! There is nothing quite as charming as a Front Porch decorated for the Holidays. Love it! A beautiful post, Laura. I'm like you about the color orange. Not a big fan of it, but I do like it during the fall season! I think I am kind of old fashioned when it comes to fall, Cheryl. Laura, these are some beautiful fall images for sure! Such a wonderful time of year! I too feel energized! Thanks, Linda. As much as I love summer, and I do love summer, I am enjoying these really perfect days. I am a summer girl but I do look forward to fall. Such a pretty time of year. Love all the pretty inspiration you found to show today. I'm definitely a summer girl too, Kris and if we could go straight from fall to spring I would be a happy camper. Thank you, Rue. The weather is so lovely here with warm days and cool nights and I am really enjoying it . I love being able to open the windows too. Great inspiration! Have a great weekend! Hope you're having a wonderful weekend too, Katie. Oh I love orange, and Laura your first shot is stunning...love it. I like the way the sky goes golden as the Autumn approaches...it makes for beautiful shots. The light is so beautiful this time of year, Jen. I need to get out in the country this week. Those are beautiful images of Fall! Unfortunately, here in GA, it is hot once again. It was in the low 90's today! i'm looking forward to the cooler days of Fall.